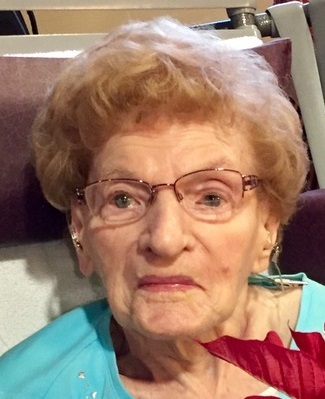 Margaret M. Cecchi, 100, formerly of Bradford, passed away Tuesday October 30, 2018, at Vincentian Nursing Home in Pittsburgh. Born May 5, 1918 in Norwich, she is the daughter of the late Frank and Augusta (Orsolina) Zandi. On July 13, 1946, she married Vandio A. Cecchi, who preceded her in death on October 11, 1994. She was a member of St. Bernard Church and St. Catherine of Sweden Church in Wildwood. She worked in catering industry as well as Corning Glass Works. She lived the values of 'The Greatest Generation.' She was a member of the YWCA Triangle Club and volunteered at their annual Strawberry Festival. She enjoyed: nature and walking in the woods, gardening, music, dancing, cooking and baking. Her cakes won several awards. She loved her family and enjoyed spending time with her grandchildren and great grandchildren. Surviving is one daughter, Barbara C. (Richard) Woodruff, of Gibsonia, one son, William J. (Ann) Cecchi, of Webster, NY, four grandchildren: Gretchen Woodruff Root, of Pittsburgh, Andrew (Lara) Woodruff, of Rockville, MD, Nicolas (Jenny) Woodruff, of Houston, TX, and Laura Cecchi Martin, of Penfield, NY, eight great grandchildren: Connor Woodruff, Ava Woodruff, Graham Woodruff, Reid Woodruff, Rory Woodruff, Adam Martin, Daniel Martin, and Ryan Martin, one sister, Clara Messimer, of Alpharetta, GA, and several nieces and nephews. In addition to her parents and husband, she was preceded in death by three sisters: Rena Monti, Mary Lance, and Doris Kinsall, four brothers: John Zandi, Leo Zandi, Carlo Zandi, and Aldo Zandi, and a grandson Joseph Cecchi. Friends will be received on Saturday, December 15, 2018, from 10:00am to 11:00am in St. Bernard Church followed by a Mass of Christian Burial at 11:00am with Rev. Raymond Gramata, Pastor as Celebrant. Committal services and entombment will follow in St. Bernard Mausoleum. Memorial contributions can be made to the Margaret Cecchi Memorial Fund, Vincentian Charitable Foundation, 8250 Babcock Blvd., Pittsburgh PA 15237. Arrangements are under the direction of the Hollenbeck-Cahill Funeral Homes, Inc.